And y’all. ALL OF OUR LUGGAGE IS HERE. So that means that 21 checked bags and 21 tubs of supplies have arrived. Amazing, huh? It was really sweet of the Lord to handle that for us. It has been awesome so far. I don’t even know if I’ve told you, but we are putting on a Youth Camp, much like the one that we just returned from in Marietta. I got to go to the camp site today and just being there again got me SO EXCITED. I haven’t slept in about eleventy-eight hours, so I’m sorry these sentences are short and somewhat on the level of a struggling sixth grader. Here we are playing Bananagrams in the Jersey airport. Thank you, Mrs. Veronica, for hooking us up. We are loving it and we are a lot smarter. Which by the way, is “fleeted” a word? This is from the airplane. I could seriously have church just by looking out an airplane window and listening to my iPod. There are few sights as beautiful to me as the view out a plane window above the clouds. Here are our sweet high school girls. I figure their parents will appreciate seeing that they are smiling and not crying. (Carly, Laura, and Amy) And they are with an adult. Me. I’m not sure that makes you feel better. Forget that part. And this is the only pic you are getting of me so far. With my first and only souvenir. I love me some Scottish jewelry. Don’t be jealous. I’ll let you wear it. As long as you don’t go out of my line of vision. Because I’m so in love with this ring that I can’t even take it off. Uh, nice face, Katie B. Please continue to pray for us. The house we are staying at- the water shut off today. Can you say “our battle is not against flesh and blood”? But we are praying and believing that God is always for us and He is our provider, so we won’t worry. Just keep praying. You can check our blog (scotlandteam08.blogspot.com) to read updates daily. Mama will be doing that one and she has more access to internet, especially once camp starts on Sunday. Also, we are lucky enough to be able to do a live feed of our services and some interviews here (riverstonesummercamp.tv). So check back after Sunday and you should see some awesomeness. 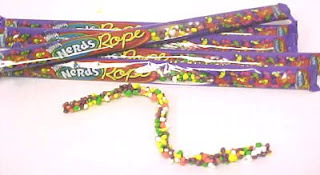 Oh, and by the way Sarah, this is a nerd rope. You need one. Or twenty-two. Hope and Naomi will dig them big time.